A photo full of legends. We reckon Novak Djokovic's local picture framing shop is about to get a bit of extra business. After the Serb dismantled Rafael Nadal in straight sets on Sunday night to win his record seventh Australian Open title - and 15th career grand slam - there were plenty of compliments thrown around about where he sits among tennis's elite. But who needs words when you've got a happy snap like this? 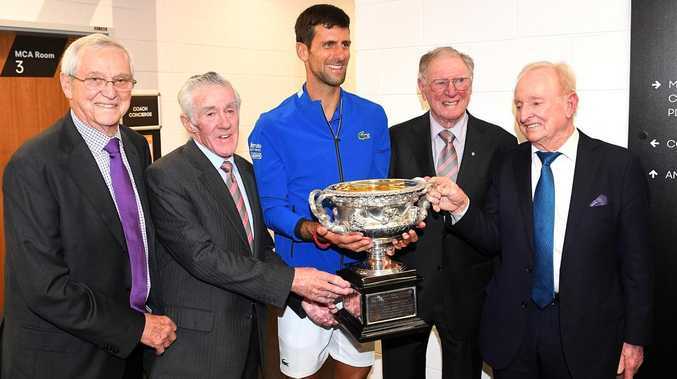 As Djokovic celebrated his latest triumph with the Norman Brookes Cup held firmly in his grasp, he was joined by a group of Australian legends who were too happy to pose with a man considered their equal. Or at least, most of them were. What’s the collective noun for a group of greats? Before Sunday, no man had ever won seven titles at Melbourne Park. Roger Federer has six, as does Roy Emerson, who joked before the match he would be barracking for Nadal because he didn't want to see his record get overtaken. Emerson's wish didn't come true but the former World No. 1, who won 12 majors in the 1960s, didn't seem to mind, getting in on the action when today's top dog jumped in front of the cameras. But maybe his smile wasn't completely genuine and he was far from thrilled to be part of the picture perfect moment. Speaking in his press conference, Djokovic said: "Mr Emerson said to me he's p***ed with me because I broke his record. That was definitely the best and most expensive photo of the night." Emerson was on the far left of the frame and next to him was Ken Rosewall - an eight-time grand slam singles champion and an Australian sporting icon who has an arena named after him in Sydney. 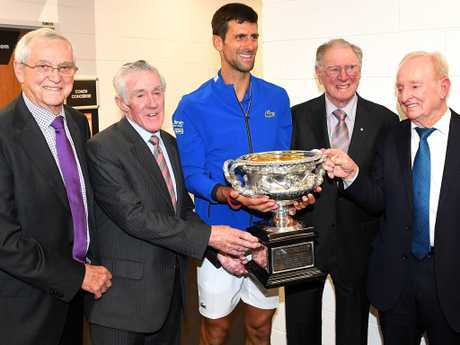 Djokovic split the pack and on his left was Victorian Frank Sedgman, who won 22 major trophies in singles, doubles and mixed doubles across five years in the late 1940s and early 1950s. On the far right was a man who's part of the furniture at Australian Open finals, given the decider is played in a stadium named in his honour. Rod Laver, an Aussie who is firmly in the debate about being the greatest tennis player of all time (GOAT), rounded off the iconic photo that Djokovic will no doubt cherish forever. It's undeniable that Djokovic has earnt the right to stand alongside giants of the game and may well challenge the likes of Laver and Roger Federer for GOAT status if he maintains his winning run. But one image that will probably be even closer to his heart was one that popped up on social media during the match. Djokovic's wife Jelena and his two children Tara and Stefan weren't in Australia to attend the match but they were still supporting the man they love from afar, as a photo uploaded to Twitter by Jelena showed. Djokovic's heart melted when Channel 9 presenter Rebecca Maddern mentioned it during his post-match media rounds. "Yes, please keep it there (on the screen) for a while," Djokovic said. "Oh my gosh, I love it." Asked if he missed his family, the 31-year-old replied: "Of course I do. In the moments like this, even more. But I'll be there in a few days, we'll share these wonderful emotions." The heartwarming reminder of what was waiting for Djokovic back home came after he paid an emotional tribute to his family at the trophy celebration immediately after the final. "I would like to say hello to my family starting with my wife and my son Stefan," Djokovic said. "I hope they were watching. Well, at least they said before the match they would watch. "Trophies are even more special when I have someone so dear and so special to me in my life to share this with. "They are my dearest people on this planet, next to my two brothers and my parents. I love them very much. I want to thank them for unconditional love and support through all these years. "They have sacrificed a lot of their time and energy for me to live my dream, to be standing here today and I try to always remind myself and not take that for granted."